Think of the times we used to sit together, chit chat and listen to stories as the sun goes down. 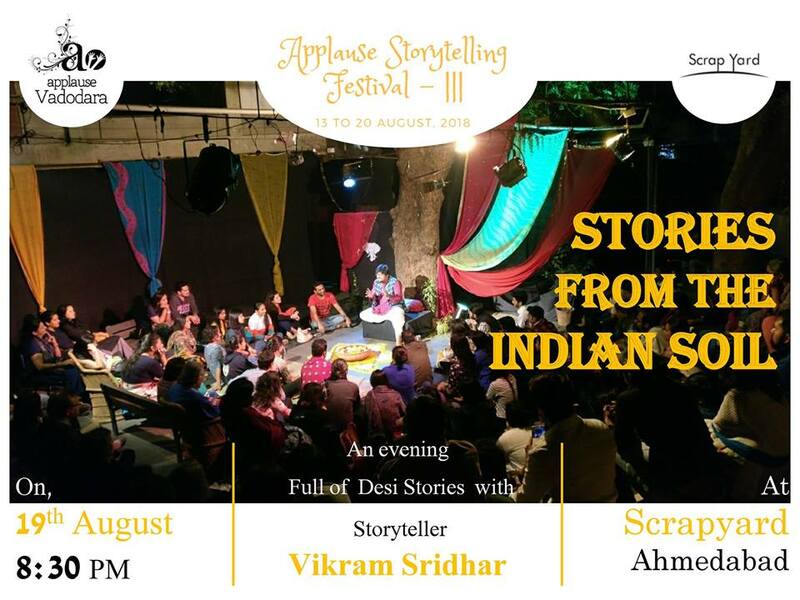 The late evening Oral storytelling session for adults by Vikram Sridhar will explore stories from People ( folk ) tales inspired folklore, mythology, politics, nature, etc. over an hour from various parts of our fabulous country. The stories will bring in emotions of love, valor, envy, joy, etc. Vikram Sridhar is an Engineer and MBA by degree. Growing up in Chennai he’s now is a Performance Storyteller and theatre practitioner who believes in Storytelling as a strong medium for Conservation, which is highly relevant in the modern context. The performance is brought as part of Applause Vadodara – Theatre and Art’s Storytelling Festival 2018. On its 3rd edition, the festival for children and Adults travels across Ahmedabad, Baroda, Surat and Anand.